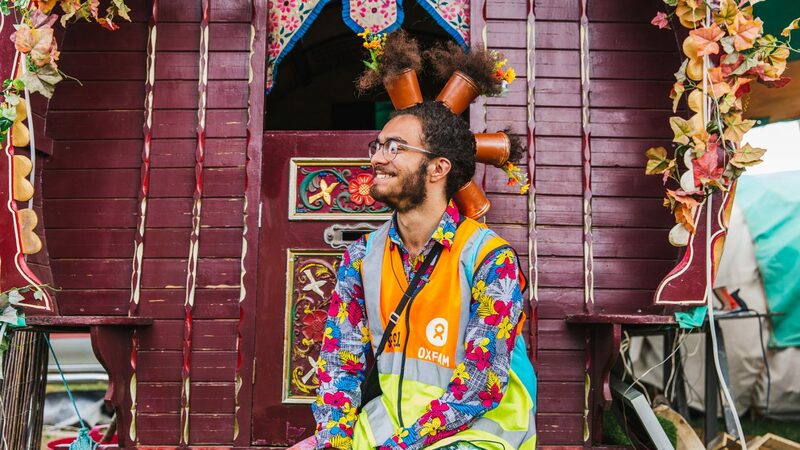 Stewarding is a great way to enjoy the festival while also helping some of the poorest people in the world break free from poverty, even while you’re dancing in fancy dress! You’ll be supported by an experienced Oxfam team on site and by volunteering your time you’re helping fund the amazing work Oxfam does in disaster relief and development projects worldwide. Stewards must be 18 or over by the day they arrive on site for their first festival but you can attend the stewards training while aged 17. You will be asked to work 3 x 8.25 hour shifts during your 6 days at the festival, usually a morning shift, an afternoon into evening shift and an overnight shift. There is plenty of time to enjoy the music in between. In return, you get entry to the festival, separate crew camping with access to showers, 24hour free tea & coffee, phone charging in the Oxfam social marquee and 3 meal tickets to use during the festival. When you apply, you will be asked to supply a referee, select a training session (available at various locations around the UK) and pay a deposit of £200 which will be refunded, providing you complete your shifts and behave appropriately. A list of the details required for your application and the Oxfam Stewarding Terms of Reference can be found on their Information page. Steward applications are accepted when you complete the online form, so providing your reference is good, you attend training and your deposit goes through, there is no other selection process to wait for, you’re coming to Shambala! Join the Oxfam Festivals team on social media to stay in the loop with latest news, chat with other volunteers and arrange transport with other stewards too!